With a stay at Comfort Inn & Suites Orlando North in Sanford, you'll be within a 5-minute drive of Seminole Towne Center and Lake Monroe. This hotel is 13.2 mi (21.3 km) from Blue Springs State Park and 15 mi (24.1 km) from Wekiwa Springs State Park. This hotel is located on the shores of the beautiful Lake Monroe, in Sanford, Florida, the 'other side of Orlando'. It is within walking distance of the downtown business district, River Ship Romance, Sanford Zoo and the Riverwalk, while Daytona Beach is just a 40-minute drive away. It is just 3 minutes from the Amtrack railway station and 5 minutes from Sanford-Orlando International Airport. Guests are offered breathtaking waterfront views in a tranquil atmosphere. This boutique resort comprises a total of 95 uniquely appointed rooms with marina, pool/garden or lakefront views and complimentary high-speed Internet access so guests can stay connected. Whether here for business or pleasure, guests will find the hospitality is as warm as the Florida sunshine. For those arriving by boat from the St. Johns River, the resort has a complimentary slip that is convenient and secure. This family-friendly airport hotel also offers banquetting facilities and a free airport shuttle (check with hotel for shuttle schedule). This is a pet-friendly establishment. Facilities on offer to guests at this air-conditioned establishment include a lobby area with a 24-hour check-out service, a hotel safe, a bar, a pub, restaurants and conference facilities. Guests may also take advantage of the WLAN/Internet access. Each room is tastefully designed using a soft palette of colours, unique furnishings and all the comforts of home. The rooms come with a private bathroom with a shower/bathtub and a hairdryer, as well as a direct dial telephone, satellite/cable TV, a radio and Internet access. They are also equipped with tea and coffee making facilities, an ironing set and individually adjustable air conditioning. Guests can choose from a king-size bed or 2 double beds, depending on their travel needs. They may also request smoking or non-smoking rooms, as well as wheelchair-accessible accommodation. Located in Sanford, Budget Inn Sanford is on a lake, within a 15-minute drive of Mayfair Country Club and Lake Monroe Park. 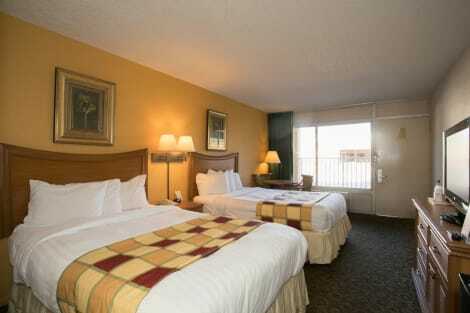 This hotel is 5 mi (8 km) from Timacuan Golf Club and 6.8 mi (11 km) from Central Florida Zoo & Botanical Gardens. When you stay at Best Western Plus Sanford Airport/Lake Mary Hotel in Sanford, you'll be within a 10-minute drive of Lake Monroe and Boombah-Soldiers Creek Park. This hotel is 17.6 mi (28.3 km) from University of Central Florida (UCF) and 13.1 mi (21.1 km) from Winter Park Village.